He brings the Victorola down to the water's edge in the fading light of day and gives it a crank. The needle lowered onto the heavy spinning platter ushers forth a prelude of dust and scratches and a twitter of violins. A clarinet's call arrests the feasting waterfowl. 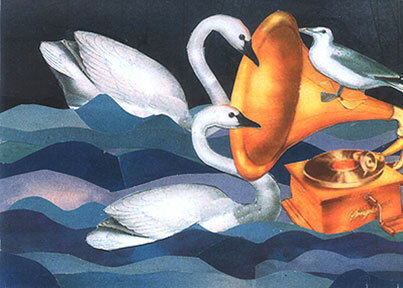 Trumpeter swans answer trumpets—an odd beebop follows as Rudy Vallee sings Orchid in the Moonlight. He smiles, lays down in the damp grass and closes his eyes. He awakens under a full moon. Pale light dancing on ripples illuminates a pair of swans a good distance from the shore craning their graceful necks probing the golden-hued trumpet of his Victorola now afloat upon the lake. The ghost-white birds take turns calling into the horn, forlorn and yearning to hear one last call from their oddly-accented brother hidden within it.